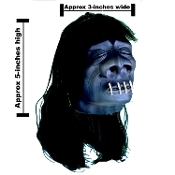 New in manufacturer packaging, SCARY REALISTIC GOTHIC SHRUNKEN HEAD! Poly Bag With Header Card. Head approx 5-inch tall and 3-inch wide. Jet Black high quality hollow rubbery plastic funny gag gift, life-like simulated Shrunken head with synthetic fake nylon hair,classic lips sewn shut and hanging string cord. Hang everywhere at Halloween party, in teen room, back yard Luau pig roast or retirement celebration decor! Hang from your door or auto rear-view mirror to scare your friends, get a needed laugh, or raise some eyebrows while sitting in traffic! even great as a creepy fence finial topper or cane for witch-doctor costume! FOOL YOUR FRIENDS... SCREAMS EVERY TIME! HEAD and HAIR are JET BLACK... photos are lighter to show detail. For entertainment and decorative purposes only.